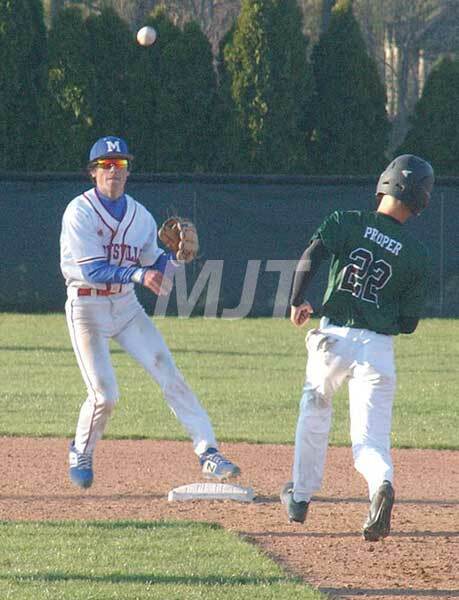 Marysville infielder Payne Miller (left) gets the force out at second and throws the ball over to first in the bottom of the seventh on Monday. The Monarchs did not get the double play, but went on to beat Dublin Coffman, 8-5. There have been rare occasions in which Marysville High School’s baseball team has beaten Dublin Coffman. Monday’s 8-5 triumph on the Shamrocks’ diamond might be the most important one to date in recent memory. In turning back the Shamrocks, the Monarchs kept their Ohio Capital Conference Central Division record unblemished at 5-0. The Monarchs (9-5 overall) plated four runs in the visitors’ portion of the second inning. Coffman tied the game at 4-4 by the end of the fourth. Marysville, though, tallied four runs in the fifth to seal the victory. Gabe Schaeffer, Jack Christian and Christian Colvin each singled in the fourth. Schaeffer later scored on a wild pitch from Coffman pitcher Ryan Ebling and Payne Miller singled in a run. Michael Bonczak walked and Chase Kilgore tripled in a pair of runs for a 4-0 lead. Dublin scored once in the second and added its tying runs in the bottom of the fourth. The Shamrocks’ big inning came as the result of base hits from Ethan Hetzel, Alex Dluzynski and Nathan Kassis. Schaeffer and Matt Belt both singled to get things started in the fifth. Christian reached base on a fielder’s choice in which no outs were recorded. With the bases loaded, Trey Storr broke the stalemate with a run-producing single. Bonczak lofted a sacrifice fly that brought in a run and gave the Monarchs a 6-4 advantage. Kilgore then singled in two more runners. The Shamrocks (who will have a return contest at MHS on Wednesday) scored a consolation run in the home half of the fifth. Christian started on the mound for the Monarchs. He went six innings and allowed 11 of the Shamrocks’ 12 hits. He fanned five and issued one walk. Blaine Williams pitched the bottom of the seventh and earned the save. “This was a good win against a good Coffman team,” said MHS head coach Nick Blake. “We were able to string together a couple of two-out RBIs. Blake said the Monarchs’ strong offensive showing (11 hits) came as a result of not overthinking the process.